When drivers encounter a car accident or is stuck at the side of the road due to a vehicle breakdown, they want a quick towing service to get the issue solved. For towing companies, it is necessary for them to know the right type of tow truck for the job in order to keep the vehicle safe without causing damage. Wheel lift tow trucks have with hydraulic booms with crossbars situated at the ends. These crossbars can be moved below the rear or front wheels of the vehicles. Then the vehicles are lifted with the other two wheels on the road. Depending on the transmission of the vehicle, the operator can lift either the front or rear pair of wheels. Wheel lift towing is commonly used for two-wheel drive automobiles and for quick short distance tows. One major advantage of this towing vehicle is it can get into tight, narrow spaces and low parking structures. It is fitting to tow vehicle which is parallel parked, inside the parking garage or on narrow roads. Depending on towing companies, this towing method can also be cheaper. Flatbed tow trucks have slanted platform that is able to be inclined or moved to the ground level. This allows the vehicle to be placed onto it. When the towed vehicle is unable to be driven up to the platform, it can be towed using a winch system. Once on the platform, the vehicle can be secured using chains or towing straps. Flatbed towing is great for long distance hauling. It is also preferred when towing four-wheel-drives and for towing damaged vehicles. The highlight of this towing method is the level of security it can provide. 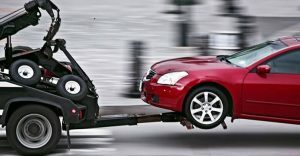 When the vehicle is secured onto the flatbed, the possibility of suffering damage from towing is greatly reduced. In addition, with the wheels lifted off from the road, it is good for the transmission. The downside to flatbed towing is they are not as mobile and can’t get into tight spaces. The most notable difference between flatbeds and wheel lift tow trucks is the level of security they can provide. Flatbed tow trucks widely considered as the safest, as they do not need adjustments, and towed vehicles can simply be placed on the platform without damaging any parts of the vehicles. Another difference is size, for most flatbed tow trucks are bigger compared to wheel lift. Thus whenever there are towing situations involving getting into narrows spaces or busy roads, wheel lift towing will be considered as the preferred method.